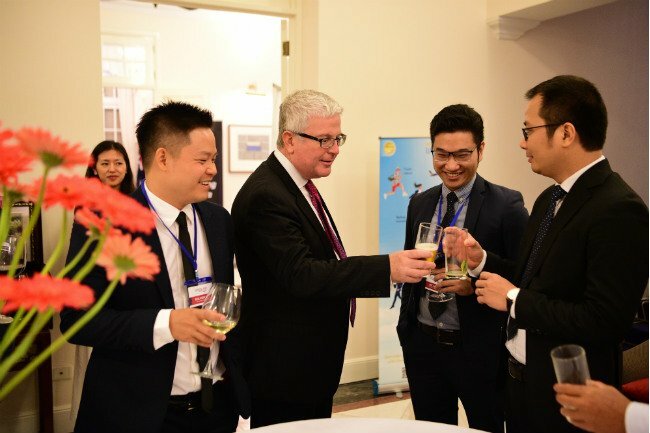 Twenty-two young leaders representing Australia and Vietnam will take part in the 2019 Australia-Vietnam Young Leadership Dialogue (AVYLD), which will be held in Hanoi and HCMC from May 26 and 30, the Australia-ASEAN Council has announced. On this occasion, Australian Ambassador to Vietnam Craig Chittick held a reception at his residence late last week to welcome the 2019 AVYLD delegates and celebrate their exciting journey ahead. "The Australian Government via the Australia-ASEAN Council is a proud supporter of the Dialogue. It was inspiring to have been part of the process to select the delegates for the 2019 Dialogue. There is no doubt that the selected delegates will help shape the future of Vietnam and Australia. I look forward to strengthening our bilateral relationship with Vietnam through this significant platform," said the Australian ambassador. The five-day dialogue aims to facilitate deeper cross-cultural understanding and collaboration through discussions and workshops with speakers and peers from both Vietnam and Australia. This year, the dialogue centers around the United Nations’ Sustainable Development Goals under the overarching theme Beyond 2019: Creating Our Sustainable Future Together. Within this theme, delegates will have the opportunity to be provided with new perspectives that can shift mindsets and drive action towards achieving a brighter future for the countries and the world. The 22 young leaders, 11 from each country, were selected from over 2,000 candidates. They are active in multiple sectors including arts, agriculture, technology, sports, business, education, environment and human rights. Nguyen Duy, a Vietnamese 2019 delegate and co-founder of the Startup Vietnam Foundation, said: “If asking myself, how the future looks like, these keywords will pop-up in my mind: young generation, sustainable development, global care, human links, and I can find all of these in AVYLD. I strongly believe that engaging with young leaders from diverse backgrounds from both countries and learning from other senior leaders at the dialogue will be a lifetime experience”. As an Australian young leader chosen as a 2019 delegate, Alli Devlin, an alumna from UTS in Sydney and site engineer at Lendlease, says, “I am looking forward to engaging in thought-provoking conversations with fellow delegates which may stimulate innovative project ideas for positive and long-term impact. With other delegates, I want to unravel the complex social, economic, political and environmental issues facing our nations, both now and in the future. I want to drive profitable and sustainable construction in both Australia and Vietnam”.